There’s never a dull moment onthe island! 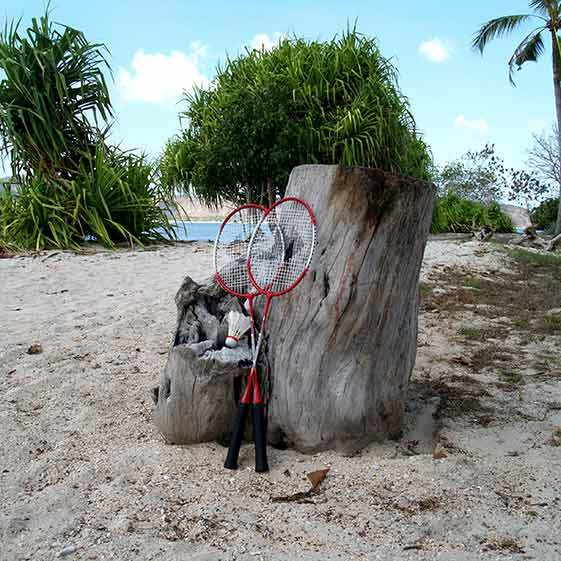 If you’ve had of relaxing you can enjoy one of the many activities that we offer for our guests here at Gili Asahan Eco Lodge.  Gili Asahan offers plenty to do and see on foot! Start your day with a walk up to our yoga Shala to enjoy a beautiful sunrise or a self-practice yoga session. Just a little further on up and you will find yourself on the Hills of Asahan with breath-taking views of sunrise, sunset and the tranquil bay that surrounds us. 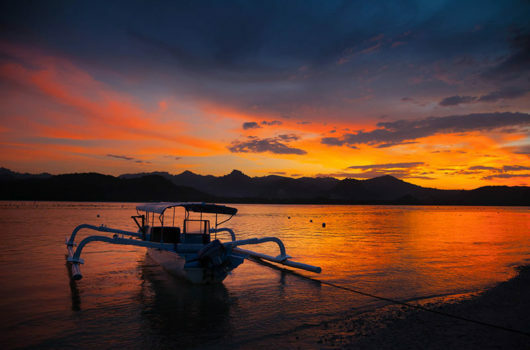 Take a scenic walk around the islands via its stunning shores, making your way through the local village where you can meet the friendly people of Gili Asahan and immerse yourself in their culture. *The circumference of the island is circa 4,5 km. 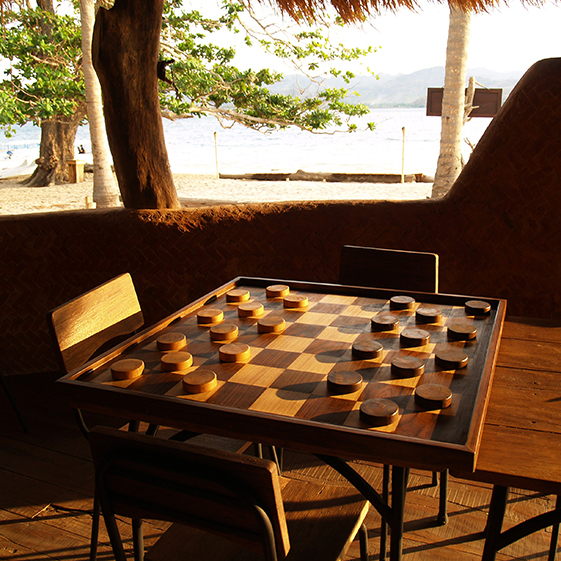 In a corner of Nautilus restaurant, you will find a variety of board games & cards amongst other amusements including chess, frisbees, bocce balls, volley ball and badminton rackets; perfect to fill in the gaps between snorkeling and eating. 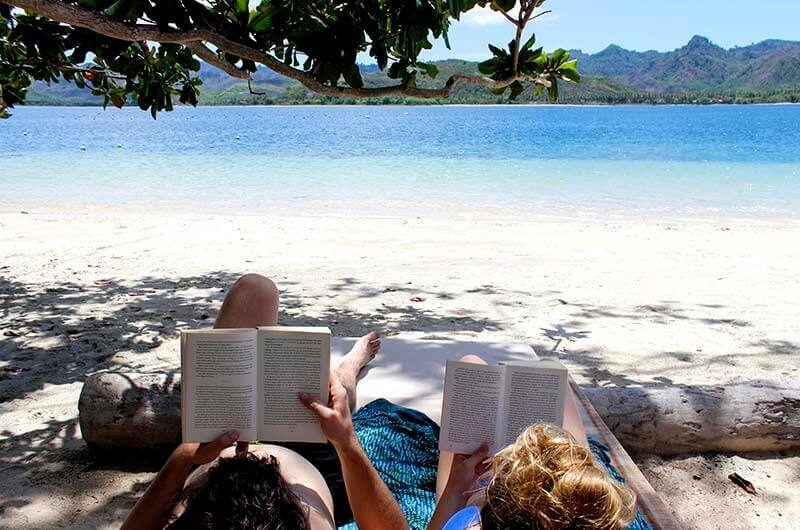 At the entertainment section, near the chill-out area of the restaurant, you will find a ‘Book Swap Library’ with a modest selection of novels in various languages. When you finish your book, you can swap it for a new one! A small collection of local and International magazines is also available here, as well as Travel Guides and fascinating nature books. 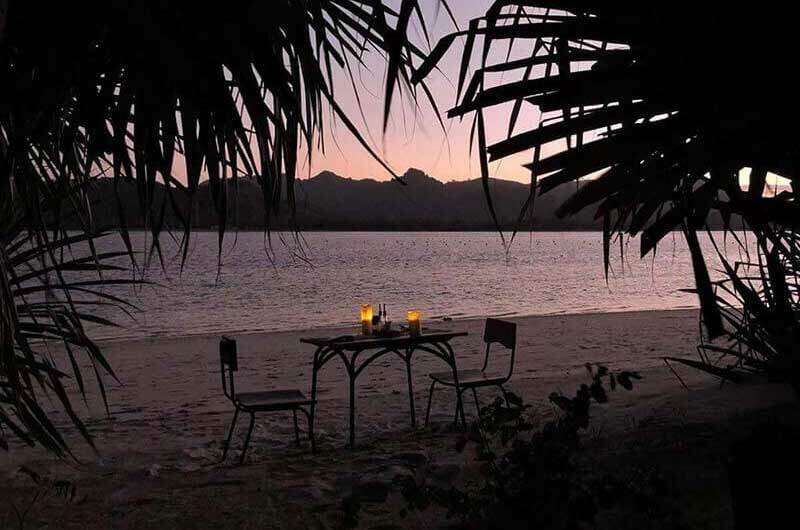 Upon request sunset drinks and a candle lit dinner can be set up on the beach complete with romantic tropical vibes table decorations and tiki torches. If you would like to request this, kindly provide the restaurant staff with details and order in advance. When the weather is right we like to set the mood for a relaxed evening by lighting a bonfire under the stars. 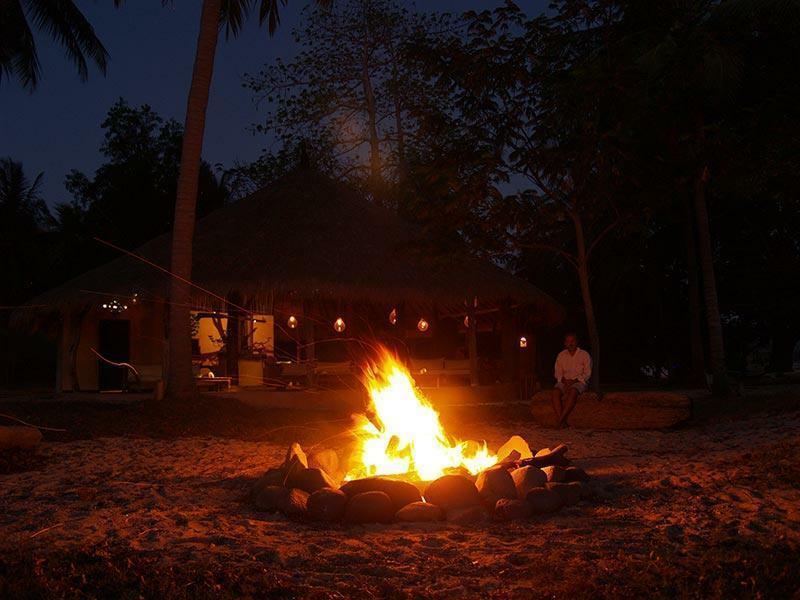 Come and relax around the dancing flames on a driftwood bench or a bean bag and enjoy exchanging experiences with other travelers or simply sitting in silence and admiring the beauty of nature. Come and enjoy beautiful sunrises and sunsets, with stunning views of the mainland and neighboring islands, from our wooden Yoga Shala located on the small hill a short walk behind the lodges. Whether you are an ice-cold beer or a Pranayama kind of person, taking a walk up to see the view is a must do whilst on the island. The Shala is equipped with power points for music and a lit stair case for night time strolls. We are available for Retreats with advanced notice. 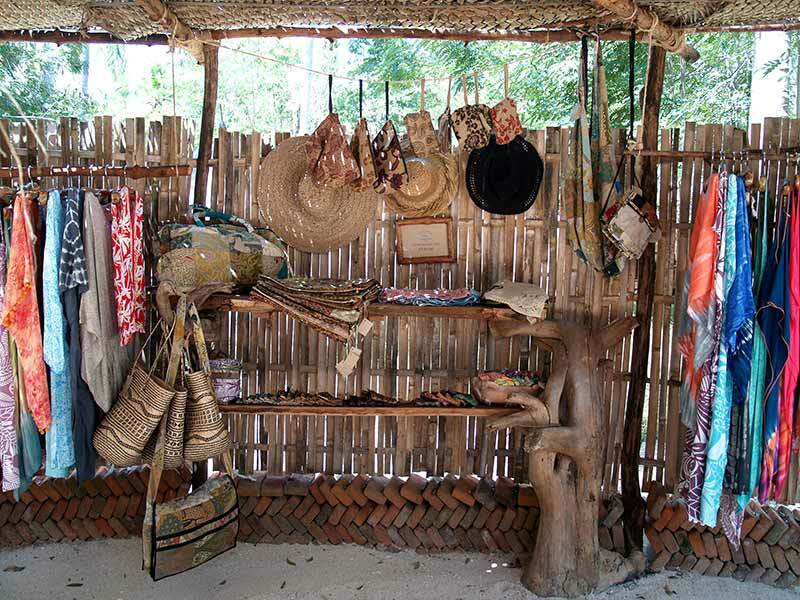 Located just between the restaurant and reception the “Beach Boutique” is filled with beautiful, carefully selected, handicrafts and apparel all hand-made in Indonesia. 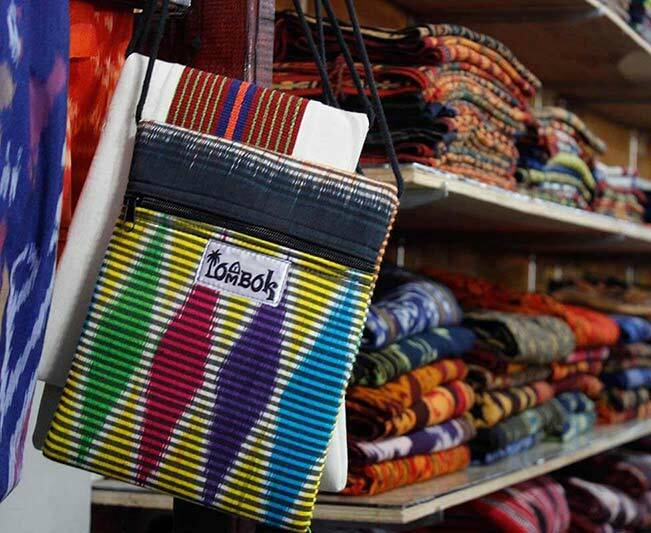 Here you will find everything from everyday beach essentials; such as shorts, dry-bags or beach dresses, to beautiful souvenirs to take home to your loved ones; such as colorful bracelets and key-chains, batik sarongs or wooden house-décor crafts. The Eco Lodge has launched an original, hand-printed, t-shirt line that is also available at the shop, come and have a look! Enjoy a relaxing traditional massage in the comfort of your room or caressed by the sea breeze on the beach. Let the skilled hands of our therapist melt away the accumulated stresses of life and rejuvenate your skin and senses with delicately scented natural oils. To book please request with one of our staff by providing a time and preferred location. 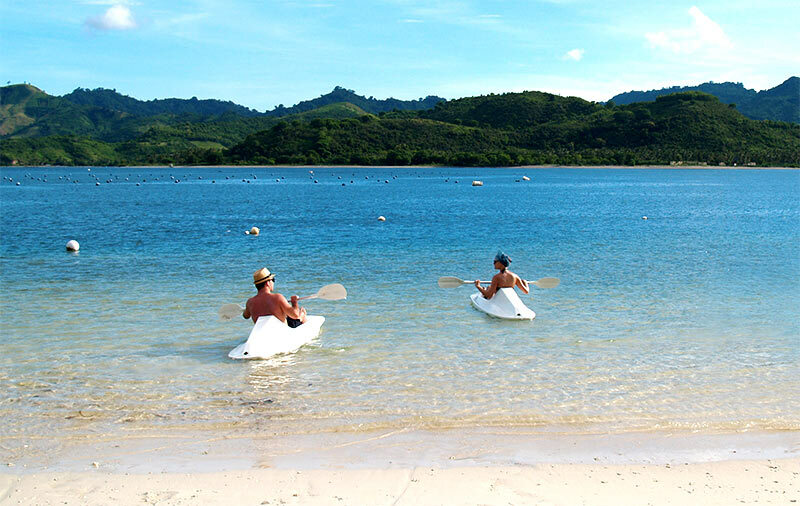 There are 3 single kayaks and one traditional outrigger canoe available for you to explore the surroundings by sea. Take a slow paddle across the bay to little Gili Goleng or tour the island through waves and over reefs. You will be asked to leave a safety deposit at reception that will be returned once the equipment has been handed back in. *Kayaks are for inside guests only. Just a short boat ride around the tip of Bangko-Bangko, home of the world-famous surf spot Desert Point, you can enjoy the vibrant tropical sunset on the sea with a cold drink at hand the sound of the roaring waves setting a mood for pure relaxation. *drinks upon request, only water included in the price. 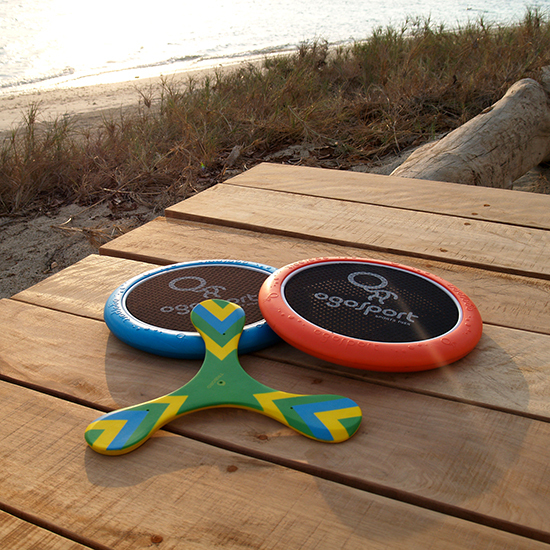 Feel like going island hopping and discovering the unexplored treasures of the secret South Gilis? Then there’s no better way than by outrigger boat! Come to reception where we can tell you more about the many neighboring islands and reefs and tailor a trip to your preferences! Price: prices will vary depending on occupancyand itinerary. Meal and drinks available upon request. Trips to see world famous waves Desert Point from the sea can also be arranged. Watch the wave form and break and hear the loud roar of the foam crashing on the shallow reefs while you enjoy a colddrink on the boat. Island hopping excursions can also be taken on the newest member of our fleet M.V. Timelight, find out more about the boat in “fishing trips”. Located just around the tip from world famous waves at Desert Point the Eco Lodge is the perfect place to stay if you want a nice meal and fresh bed after a long days surf! We offer boat trips to the wave for IDR 150.000 per person (min 4 people/3 hours) Upon request we can also arrange local taxi boats for longer trips with fewer or more people. The price will vary depending on the length and occupancy. A gentle reminder that we do not take responsibility for any injuries; You enter the waters by your own choice and at your own risk. 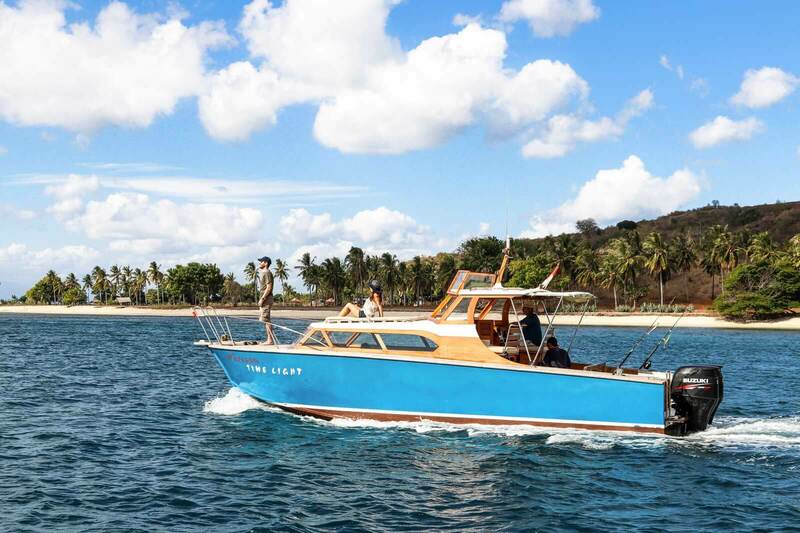 We would like to welcome you aboard M.V.Time light, a new and exciting way to explore and discover the hidden archipelago of South Lombok’s Secret Gilis. Measuring 9.2m this motor vessel can welcome up to 8 passengers between the spacious inside cabin and outside deck area. 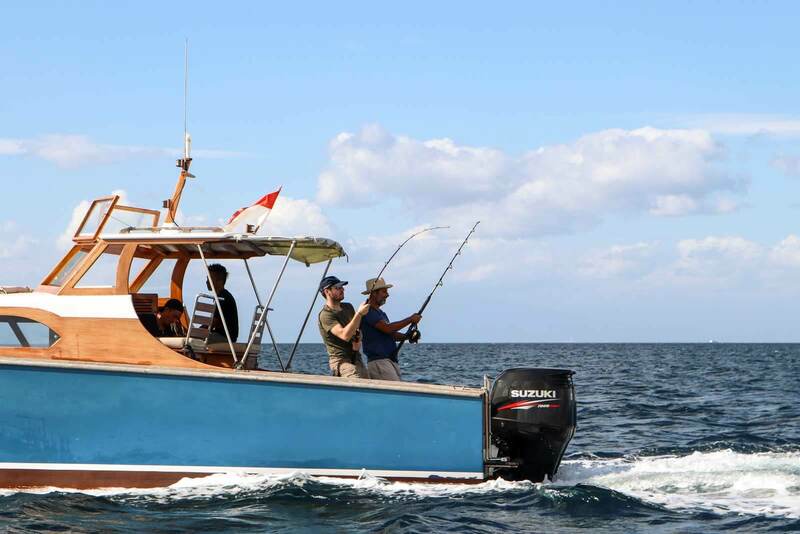 The boat is equipped with Raymarine Dragonfly GPS (chart plotter and sonar), 2 new 150 HP Suzuki outboards, VHF Radio and 2 fishing rods (15/20kg & 50/60kg) making it the perfect vessel for a fishing trip. The inside space features a modest yet luxurious dining area, kitchenette, small lavatory and single bed while the outer deck space boasts comfortable and spacious daybeds for sightseeing and sun soaking;ensuring everyone a great time on-board Time Light. On board you will also find 9 life jackets for your safety during activities. 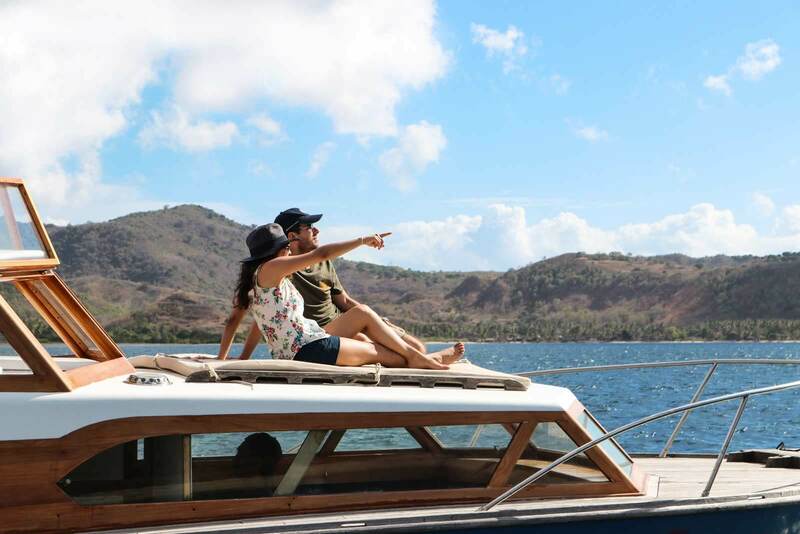 Our captain is a seasoned, trained sailor and extremely familiar with the local seas leaving you in great hands with nothing to worry about except basking in the beauty of South Lombok’s calm waters and catching lunch! Please contact us directly for more information regarding the possibilities & prices. 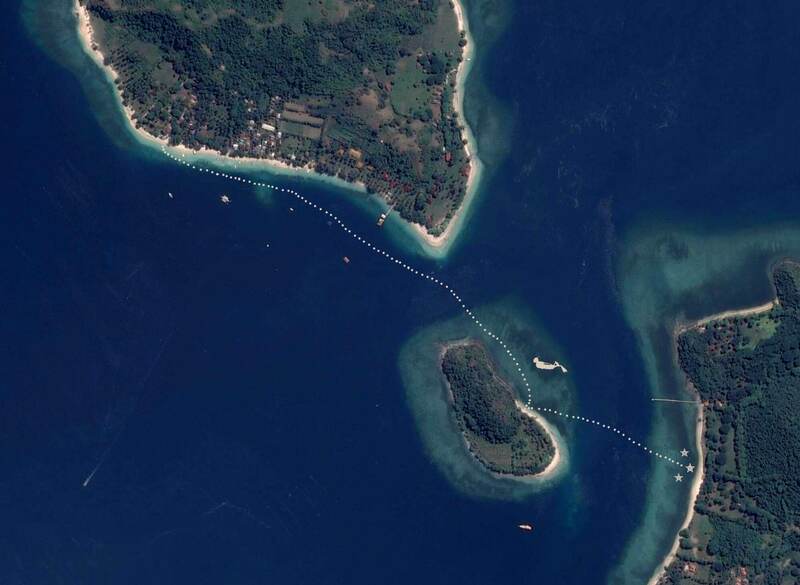 Across a short channel from us you will find the beautiful little island of Gili Goleng. 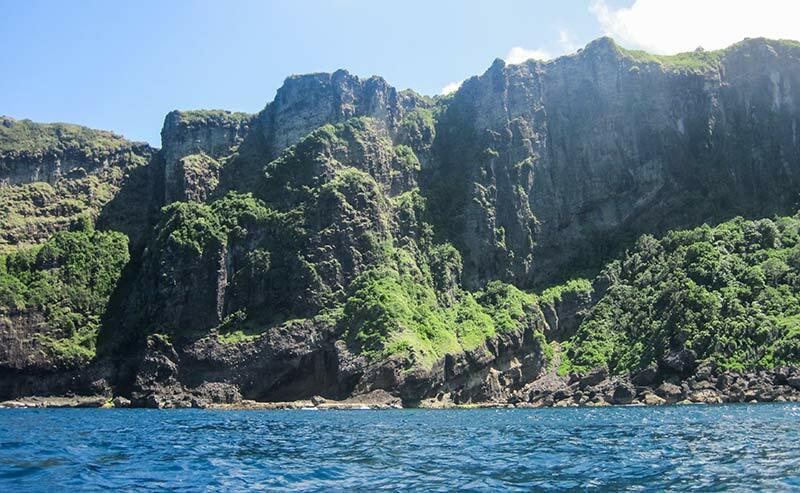 A perfect destination for a little kayak trip to explore the surroundings and get to know the area beneath the surface. The island offers great snorkeling and a secluded beach that will make you feel like you are castaways! With advanced notice we can pack a picnic box to take with you and enjoy on the beach. A little further, on the mainland directly across from Gili Goleng, you will find another white sand beach, seasonallyoffering a vast display of starfish and always full of other remarkable little sea creatures, also reachable by kayak. Gili Asahan offers an abundant selection of snorkeling spots, starting with right in front of your bungalows! The most beautiful areas to snorkel around the island are marked by white buoys in the water that you can either reach by kayak or swimming from the beach. Both the Kayaks and snorkeling gear are included in your stay with us and can be picked up at reception with a security deposit that will be returned upon receiving the equipment back. Let us take you on a snorkeling trip you will not soon forget! Come explore various neighboring islands reefs and discover the immensely wide variety of colorful sea life that inhabits the pristine waters of this little hidden archipelago. Trip Length: 2-3 hours to a minimum of 2 reefs. 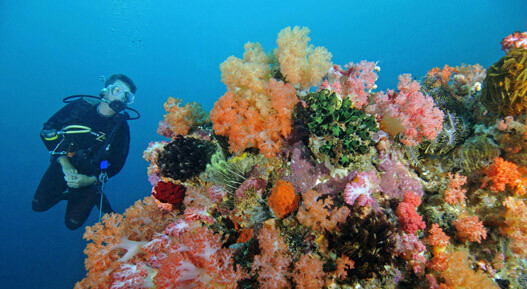 South Lombok offers some of the worlds most uniquely beautiful diving spots. If you want to get close and personal with some colorful sea creatures just let us know at reception and we will organize a trip for you through the trusted local Dive Centre. For itineraries and prices please visit giliasahan.com/diving . 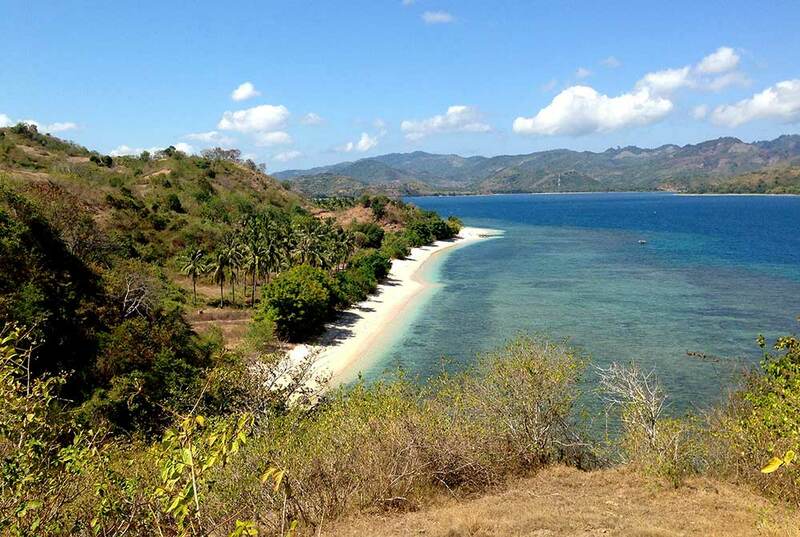 The nearby mainland, Lombok is full of beautiful places to visit. Whether you are into nature & culture and want to wander through local villages & natural landscapes, or more into Urban lifestyles and want to explore the hustle and bustle of Lombok’s cities Kuta and Mataram. Ask us about the different tour packages we can arrange for you! You can also create your own personal itinerary from the various options! Join Bapak Junaedi and his trusted guides and drivers on a mainland adventure packed with culture and sight-seeing! Pickup can be arranged any time between 8am and 10am, we suggest an early start get the most out of the day. Choose one of the two Set Tours or create your own custom adventure! *For privately arranged itineraries prices vary according to preferences. „Snorkelling here reminds me of snorkelling in Terengganu in 1990. It's 2015 now. Reefs are in tip-top conditions and fish population is healthy and thriving, the locals don't fish bomb anymore. I look forward to return!" „The reefs around Gili Asahan are pristine. I have seen plenty of reefs before but the ones around Gili Asahan are top notch, without a doubt. You don't even have to take a boat to go snorkeling. It's right in front of your bungalow! If you're not too much into water activities, there's still plenty of things to do. Relaxing on the beautiful beach, climbing through the jungle to the top of Gili Asahan or doing yoga with probably the best view you ever had (amazing sunset view from the yoga sala!!! Absolutely breathtaking!)." „Great to be able to have use of the kayaks and snorkel equipment included as there is good coral just off the beach and the water is calm enough you can easily kayak. With a decent pair of shoes at low tide it's possible to walk around the whole island. Sunsets are stunning!!!" „The snorkeling spots are everywhere just in front of the resort. Very nice. They provide free snorkeling gears, games, and wifi for free. There's also a place for a fireplace in front of the restaurant." „You don’t need a boat ride for snorkeling, just walk to the beach and plunge into the warm sea. The reef, where you’ll find wonderful corals, turtles and all kinds of barrier fish, is just around the corner! You can walk the island in two hours and enjoy a wonderful landscape from the hill. A perfect spot for anyone who wants to relax." 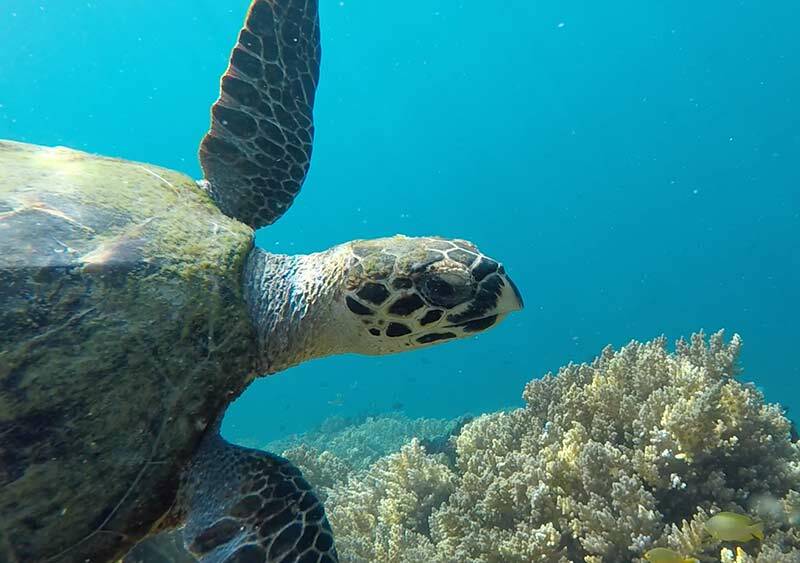 „Snorkeling on Gili Asahan and the neighbouring islands are amazing!"